Many wrap manufacturers tell half the story: If specs call for full ISO 6944 testing standards, industry veterans may assume fire rated fire wrap is tested for 2 hour conditions. Not so. 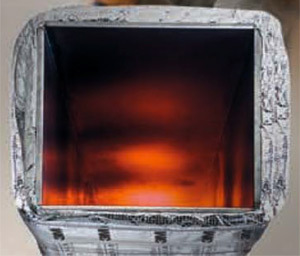 Ceramic fire wrap for non-grease applications is only 2 hour tested for fire outside (Type A) conditions. Insist on full compliance for all four fire conditions: Type A and Type B Horizontal and Vertical. Conquest Flamebar™ BW-11 coated duct systems are code compliant for either 2 or 4-hour conditions. 1“Tested” refers to product evaluation tests conducted by a recognized International Accreditation (IAS) organization, and which carry a label, symbol, seal or identifying mark, and whose directory listings state that products meet identified test standards.